I have dry skin all year round, however when the weather gets colder and we turn on the heating; it get's 100x drier. Whenever my skin gets dry or feels dehydrated I always reach for the Origins Drink Up Intensive Overnight Mask, this is incredible. I pop it on at night and immediately my skin feels so hydrated. When I wake up in the morning, it makes applying foundation so much easier as it prevents dry patches on my skin. 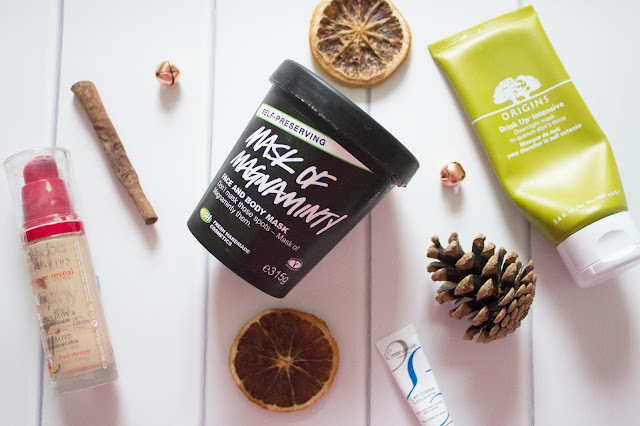 Another mask I love is the Lush Mask of Magnaminty, I actually use this all year round as it's amazing at getting rid of blemishes and reducing redness on my skin, I tend to get more breakouts in winter so I use this much more often to calm them down. I need a moisturiser which is going to allow my foundation to look great on my skin and prevent my skin feeling like a desert throughout the day, I have wanted to try the Embryolisse Lait Cream Concentrate for ages and this month I received it in my Birchbox which I was very happy about. It sinks into the skin really quickly which I love, however it also hydrates my skin amazingly. It's a definite thumbs up for this! As I've said, making my foundation look good on my skin can be tricky, I've been reaching for the Bourjois Healthy Mix Foundation lately. This is incredible if you have dry skin, I have no issues with it looking cakey or clinging to any dryness, I can apply it with my fingers/Beauty Blender/a brush and it looks lovely either way! Which products do you love to use in the winter?